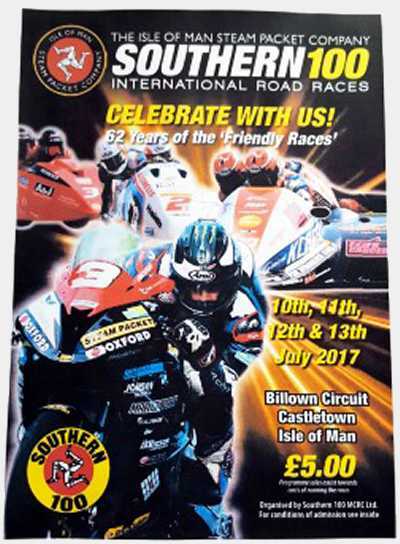 The Isle of Man Steam Packet Southern 100 International Road Races has for many years seen ‘An Action Packed’ programme of races and for the 62nd running of the event on Monday, Tuesday, Wednesday and Thursday 10th, 11th, 12th & 13th July 2017 will see even more action over the Billown Course! With nearly 300 Solo entries accepted, the organisers Southern 100 Racing, have added two extra races to accommodate the riders who want to compete at the friendly races, making a total of 14, plus the two popular Sidecar races, which also have full grids of 20. Monday evening commences with the compulsory Sighting Lap for all Newcomers and is followed by nine Practice sessions. Tuesday evening also starts with a further Newcomers sighting lap and the final three practice sessions. Then the ‘real action’ gets underway with three solo races. Wednesday has four races in the schedule, including the first of the Sidecar races over six laps. Championship Day, Thursday morning will see four solo races take place before a short ¾ of an hour lunch break. The afternoon session will see the final five races run, including the feature Solo and Sidecar Championship Races. The Solo Championship is over nine laps and the Sidecar Championship over eight. Once the final chequered flag has fallen, there is time to relax and reflect on the 16 races, before heading to the Open Air Prize Presentation in Castletown Square, which commences at 8.30pm. A fitting way to show your appreciation to all the riders who have entertained the crowds around the 4.25-mile Billown Course during the Isle of Man Steam Packet Southern 100 International Road Races 2017.